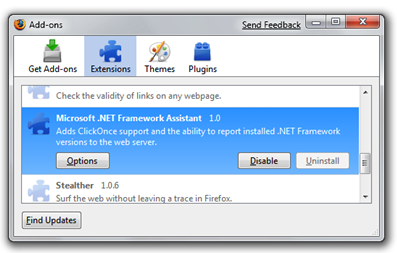 .NET 3.5 SP1 enables a Firefox Extension that allows .NET applications on Firefox, but its Uninstall button is grayed out. Since .NET 3.5 SP1 is on Windows Update and is rolling out to more users than ever before, a number of people have noticed this and are frustrated. Why is the Uninstall button grayed out? What does this add-in do? First: To uninstall completely, if you're running XP or Vista, here's an update that will make the .NET ClickOnce Extension/Addin easily uninstallable by adding on a per-user, rather than per-machine basis. This update will also go out on Windows Update if you prefer to wait. Alternatively, you can click Disable and it won't be loaded. This addin allows users to launch .NET applications from Firefox. The primary issue is that the plugin is enabled at the machine level, rather than the user level. This has the benefit of enabling the Addin for all users, but it as the unfortunate side effect of making the "Uninstall" button grayed out which makes people feel that something sinister has happened or they've lost control. There are other plugins that use this technique to enable themselves machine-wide, including Google Gears and Java, but I totally understand that some folks don't want certain Firefox Addins enabled. There are lots of other applications that include their own browser addins, many install this same way. Most of these addins are in the "Plugins" tab, rather than the Extensions tab, which might explain why fewer people freak out. My point here is that the "Extensions" tab is something that Firefox users, myself included, feel strongly about, while they think less about plugins. Extensions often affect UI and make Firefox personalizable, while Plugins usually enable system-level functionality. It's a subtle difference, but it's significant and important to remember. Extensions are personalization points for Firefox at the User level, and are thought of as such. Some addins (not ours) mark themselves as Hidden, which could be perceived as even more sinister. Ultimately since many people requested .NET support for Firefox, and we wanted to give it to them, we made this feature. When .NET was updated, this feature was included. Here's some more detail and some insight into what we're doing about it. First, this is already fixed in Windows 7 RC. You can uninstall this addin, no problem. Second, for XP and Vista, the update above makes this add-in per-user so it can be easily uninstalled like any other Firefox addin. This update will go out on Windows Update automatically soon. That means. if you already have this add-in, the only visual difference for you will be that the uninstall button will be enabled and you can remove it if you like. Going forward, for .NET 4, the team wants to host this plugin at https://addons.mozilla.org. If you want it you can go get it. If not, no worries. We're still checking on this. There's a contentType handler. This is the meat of it. We see if the mime/type being requested is "application/x-ms-application," indicating the user is trying to launch a .NET ClickOnce application. We then do some path stuff and launch our "sandbox" application that hosts these apps. // This is the function that would have been called had our overlay not stepped in. // but when 'prompt' is set the user will still have a save button. // or just the highest. That's it. Hope this helps. I'll keep my ear to the ground if anything else comes up, so stay tuned. I'm the one using FF, I use FF only because it is immunize to most of the virus. So how do I "optionally" turn the UserAgent CLR string off? The only option I see is to show the latest or all CLR versions. 1) Go to about:config, type "microsoft" into the Filter box to see the relevant config options. You say that the Microsoft .NET extension is similar to extensions from Java, Adobe Acrobat, QuickTime, Google Talk, Picasa, etc. But the machine versus user install isn't really the point, now is it? What feels like a sneaky practice is that Windows Update installs this extension to Firefox without me requesting it, while I have to specifically request the other apps you're comparing. This weekend I installed the Windows 7 release candidate and Firefox, then ran Windows Update. In addition to operating system patches, I was surprised to see that the .NET Firefox extension was quietly installed. I don't think Microsoft should touch Firefox unless I request it. RichB - looks like if the addin is enabled, then it'll always report at least ONE framework version. If it doesn't report versions, then it can't do its job, so then you'd want to disable it. Odd bugs, I'll report those. Take a look at the code above...that's not how it's written. Notice the "onaccept" and "onload" events. Perhaps what you're seeing is an effect of the about:config page throwing events? mb - I agree. The extension was installed with the 3.5 Framework. It should be an opt-in thing and that's why I'm working to get this fixed. The add-in should be hosted where all other add-ins are hosted. The reason I point out the other plugins is that, for example, Picassa never pops up a dialog that says "I'm about to install a Firefox add-in, continue?" To be clear, that's no excuse. It's just a comment that it's more common that one would think; it's not just Microsoft. * "This update will go out on Windows Update automatically soon. That means. if you already have this add-in, the only visual difference for you will be that the uninstall button will be enabled and you can remove it if you like." Communication ahead of time would be nice as a FYI. Extension still displays after using the 'uninstall' button in firefox. Check extension.rdf and extension.cache. As well it will still exist in prefs.js. Using http://support.microsoft.com/kb/963707 and deleting the folder causes firefox to hang on start. Deleting registry key isn't performed with 'uninstall' button. Manually removing the key and rebuilding the extension.rdf and extension.cache files is necessary. The NET extension is installed even if Firefox is not present (I think). I have used IE until recently, when I decided to switch to FF 3.5 (thank you Mozilla's guys for that little jewel). After the installation of FF, the NET extension was already here, greyed (as well as Norton stuff).